Out of the blue on Wednesday, May 19, 2010, I get a call from a lady with poultry and goats that I had sold an absolutely beautiful puppy to. "XXXXX is not working out - she does not have the correct temperament to be a guardian." Then continued with, "She ate two of my guineas that got into her pen! Those were some of my favorite birds." My first question was, if you were having trouble with her, why didn't you call me before now? Last I had heard, she was doing just fine. "She is so beautiful, we didn't call you...she hasn't bonded to us either." Now I am upset because I don't have a clue what the situation is, and I told her I would be there that evening to pick the dog up and Albert and I made arrangements to leave. Well, what I found was disturbing. They had given the dog her shots at least - that was good. She had been on heartworm prevention and frontline - that was good. However, the dog had never been trained, taken to obedience or socialized. She must have been confined to a very small space for a very long time because she had ZERO muscle tone. I mean absolutely none. She was starving. No wonder she ate the birds that flew into her area. No wonder she didn't bond with her owners. I started calling her "Kizzie" as I wanted her to have a fresh start and within a day, she knew that was her name. My vet came out - Kizzie only weighed 69 pounds. For her height, and at over 15 months old, she should have been well over 100 pounds. She was a 1+ on the condition scale. "My gosh, she doesn't have any muscle tone!!!" was the first thing the vet said when she saw Kizzie. We told her she actually had improved some since being with us for a few days. She was nothing but a sack of skin and bones. Kizzie's malnurishment has affected her development and some of the damage is permanent. She will never have the legs or wide chest she was destined to have or the beautiful rear assembly. Her toe nails had not been cut - she had gorgeous feet with well-arched toes as a puppy just like her mother and father, now the damage was permanent. Her feet were mishapen and splayed. Her ears. Her poor ears. When I picked her up, the lady said, "The vet said we should wash her ears out with this special medicine once a week," and made it sound like it was such a chore. (Weekly ear cleaning is "must do" in my puppy instructions.) She handed me a bottle of ear cleaner, which was full. THE DATE ON IT WAS JUNE 23rd - OF 2009! My vet sedated her so she could get her ears completely flushed out because they were so painful. Kizzie has ulcers in her stomach from starvation and the production of acid. We have started her on medication to heal her stomach. Temperament? She never wimpered or looked back in the vehicle on the way home from her former owners - she laid down and wondered what was next. She is sweetest girl without an ounce of aggression. She is a happy dog - she wags her tail and comes right to us. 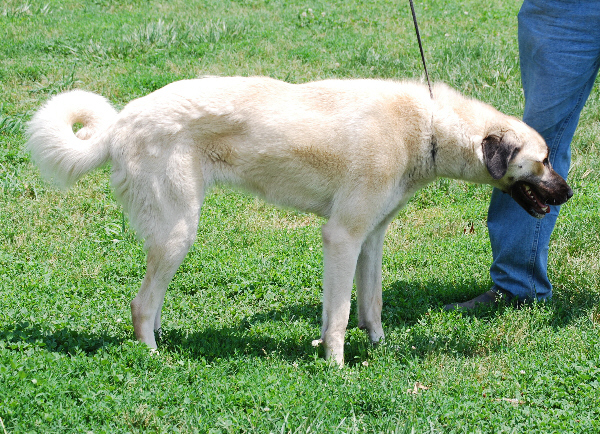 Our Border Collies and Anatolians accepted her right away - she is a very balanced dog. She sticks with Pie and I imagine that on some level she may realize that Pie is her mother, or at least the smell of her is familiar and comforting. Kizzie's sisters went to wonderful homes and they are flourishing. Kizzie has months of rehabilitation ahead of her, but she is a delight to have around and I hope her condition improves quickly. We will do the best salvage job we can. DO NOT BUY AN ANIMAL FROM ME IF YOU ARE NOT GOING TO TAKE CARE OF IT. If you do buy a animal from me and something happens in your life - job loss, death in the family - don't hesitate to call me - but don't wait until the dog is in bad shape. Things happen in life that we can't control - I know that all too well. Words cannot even describe the frustration and sadness that I felt when I saw Kizzie. Kizzie can't even stand right on her feet because they are so splayed. covered they are. The hair coat can be deceiving. She is a very thin girl. Picture on 5-23-10. Daisy's owner has done a great job with her too! She is a show dog and companion. major in April of 2010. She looks a lot like Duke! Front feet - they are looking better! Hind feet - notice the arch is back. Front feet - they have gotten some of their arch back. Compared to Hilda and Inci she still has some weight and muscle to gain! 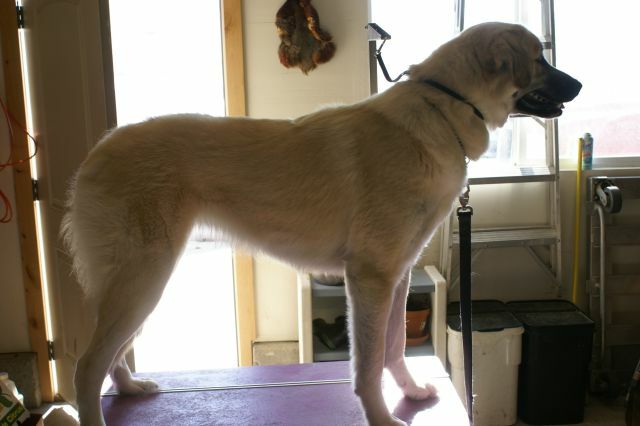 More updates to come on Kizzie's progress!